Twenty years ago, “pet related issues” may have seemed an inconsequential matter or outside the scope of professional practice for many mental health practitioners and researchers. Yet, the 2006 U.S. Pet Ownership & Demographics Sourcebook found that 37.2% of US households have a dog and 32.4% have a cat. Today, there are more than 72 million pet dogs in the United States and nearly 82 million pet cats. 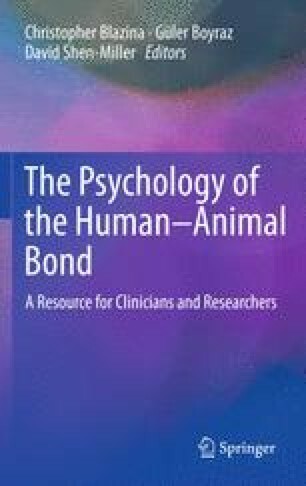 In several research studies, between 87 and 99% of pet owners defined their pets as being “like a friend or family member” (Cain, 1983; Voith, 1985). If financial commitment can be considered as one level of emotional investment, it may be safe to assume that Americans have significantly invested in their pets. In 2005, US consumers spent more than $36 billion on their pets, more than double the amount spent ten years earlier (American Pet Products Association, 2005). The total US pet industry expenditures for 2009 was $45.5 billion. It is estimated that the trend will continue, with spending to top over $47.5 billion in the United States alone. Many may wonder how pet companions have obtained such important standing in contemporary times. Endenburg (2005) has suggested that this increasing investment and reliance on pets for companionship and social support is due to recent demographic and social changes, such as smaller family size, increased longevity, and higher incidences of relationship breakdown. For many, these increasing emotional and financial investments illustrate the depth and importance of the human–animal bond.